The view out into the Hackesher Market area. I was commenting to Gerry last night at dinner that the trip to Berlin was so uneventful that if felt as if it had been just this morning when we got on the plane in San Juan. Actually it had been the day before that we left San Juan, flew to JFK, then Berlin, arriving at 7:30 in the morning. There is nothing to say about the trip: It went by in flash. I remember watching the sun set, and watching it rise, and in between I slept. Once on terra firma, we got a cab from the airport to our hotel. It was barely 9 am so checking in wasn’t an option. We got a map and directions to the train station, and so began our first day in Berlin. We didn’t miss a beat! Our hotel is just a bit out of the main area of Berlin, but steps from a train station. In two stops we’re in Alexanderplatz. That first morning we went to the third stop, and got off at Hochesher Markt. The day was pretty cold (just 50 degrees F) and drizzly on and off. We got an umbrella at the train station and began to walk. First stop: Breakfast. It was actually our second breakfast of the day, if you count the food they gave us on the plane when we woke up. This one was much better. 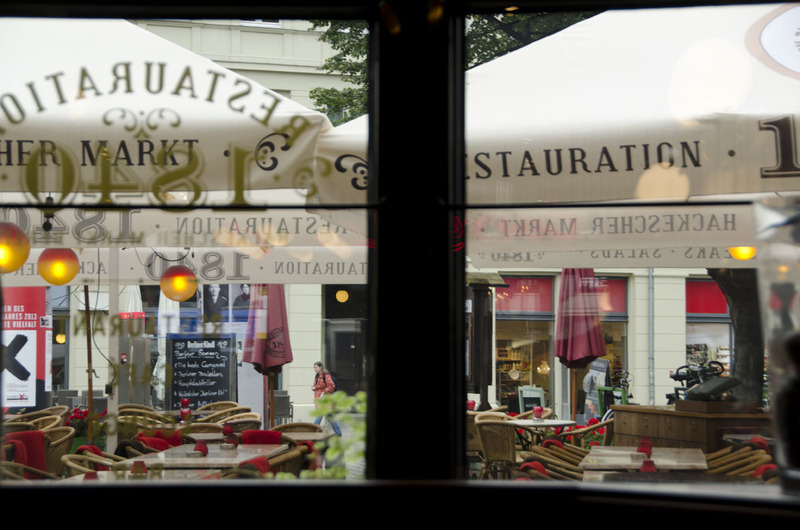 What was strange was that there were hardly any places open at that hour, and in the place we chose, an old place called Restauration, there was but one other table occupied. The coffee was good, but very, very strong. I chose my food based on the inclusion of black bread, a memory from my childhood. (This wasn’t the same black bread, but it was very good.) Refreshed and re-fueled, back out in the rain we went. 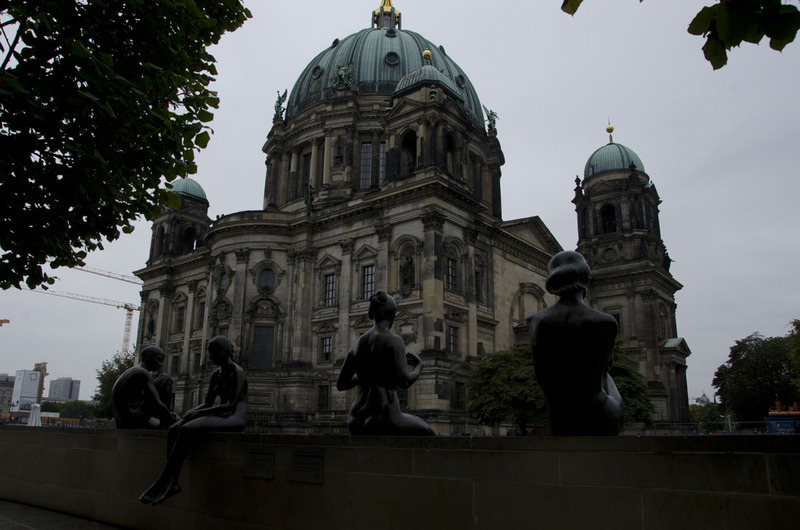 The big, important looking building that turned out to be the Berlin Cathedral. We pretty much wandered around, found the river, and saw a big important looking building and headed towards it. But as we were walking along the edge of the river, we passed the DDR Museum and due to the cold and the rain, decided it was a good idea to visit. 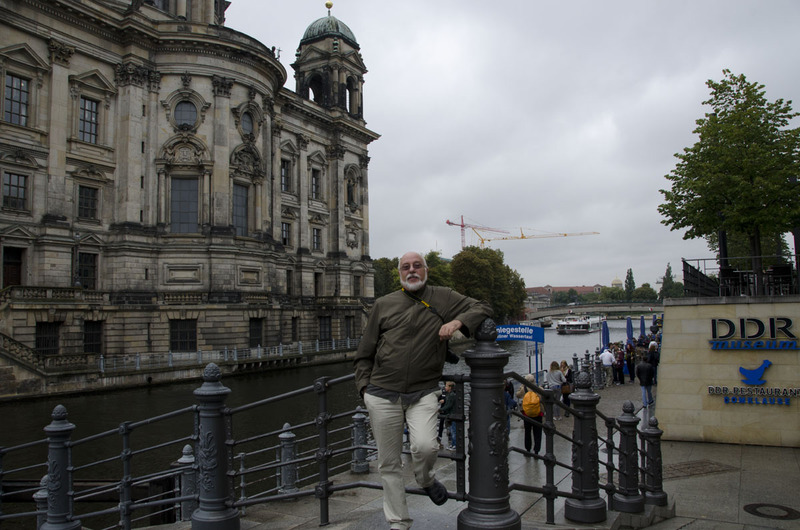 Gerry poses in front of the DDR Museum with the cathedral in the background. The DDR Museum is all about life in East Berlin and East Germany, in general, under communist rule. Like Cuba, communism was good for the poorest people, in that they were given housing and schooling and work, but yet lousy for everyone, in that there was nothing to buy. 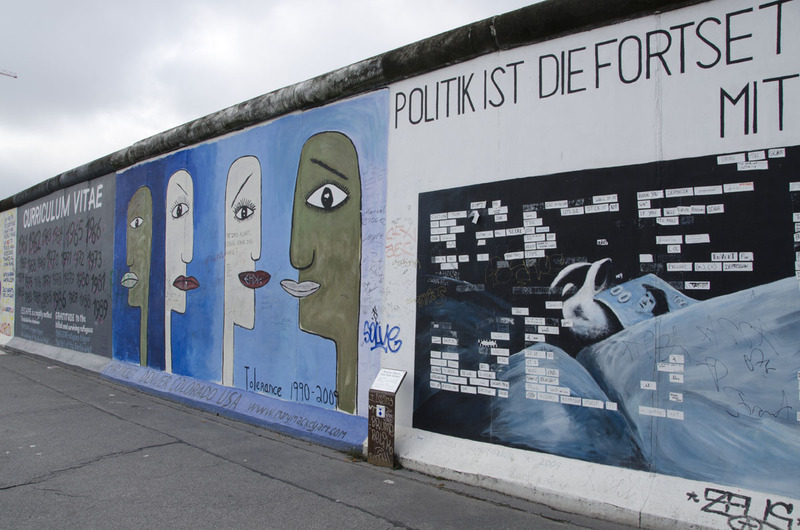 I remember, as a girl, knowing that there was a wall in Berlin that divided the two halves of the city, but what I didn’t know was that it had not always been that way. The wall was built in 1961. This morning, we walked a couple of blocks from our hotel and got to see a long section of the wall still in place. 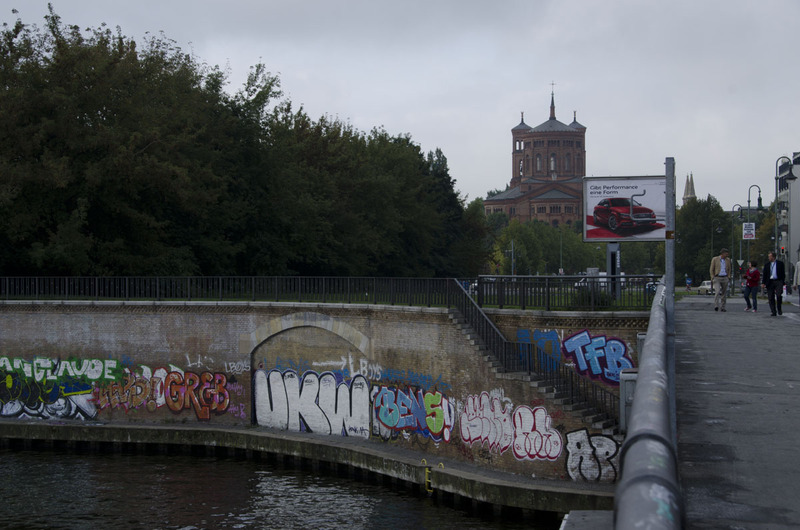 It is covered with graffiti on both sides now, but I can imagine that it wasn’t so colorful in the almost three decades that it kept the people of East Berlin prisoners in their own country. 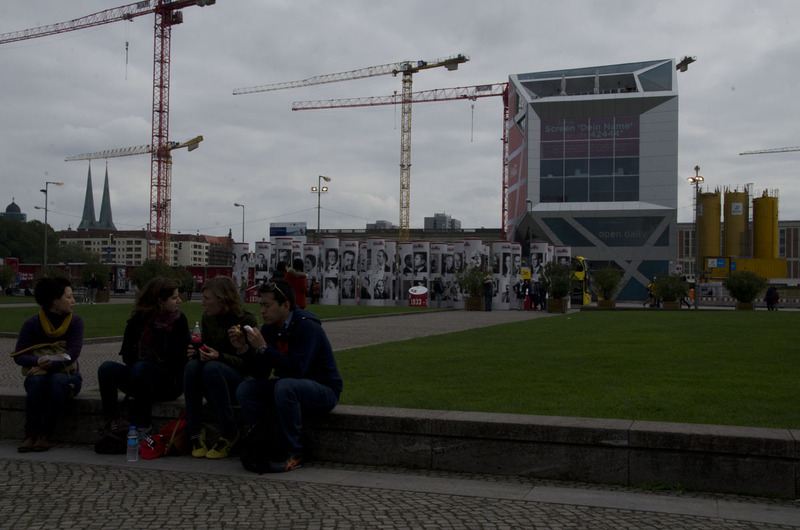 The museum dedicated a good deal of ink to the fact that it was a peaceful revolution by the people of East Berlin that opened the wall, and eventually pulled it down in 1989. The reunification of Germany is not even 25 years old. It was fun to see the East German automobile, the Trabbi. It didn’t have many parts, the thought being that the fewer parts it had the fewer parts it would have to break, but even the parts it did have, couldn’t be replaced. So again, like the Cubans, the East Germans became adept at repairing their own cars with whatever they had at hand. Later that day, we actually saw two Trabbi stretch limos! The altar from the box seats. After the museum, we headed across the river to the big, important looking structure we had seen earlier, only to discover that it is the Berliner Dom, the cathedral of Berlin. It isn’t really a cathedral: It has no bishop and is not even Catholic, but Lutheran! Beautiful inside and out, this was our first experience, of what I think will be many, of visiting a building that has been restored, post WWII. Fascinating thing about restoring buildings after the damage of the bombing of Berlin, you don’t have to restore them to what they were just before being bombed. Basically you could pick any point in the building’s history and restore it to that. It seems the Dom was restored to a point in the late 1890s, its last major redesign moment. In addition to walking around the nave, we went to see the graves of the Hollenholerns in the crypt. These were electors, marchands and kings, along with their queens, princes and princesses. From the earliest 16th century tombs, the graves ranged all the way up to the mid 1800s. Gloomy in the penumbra, it was also sad to see the number of tiny tombs of the babies who didn’t make it to their first birthdays. 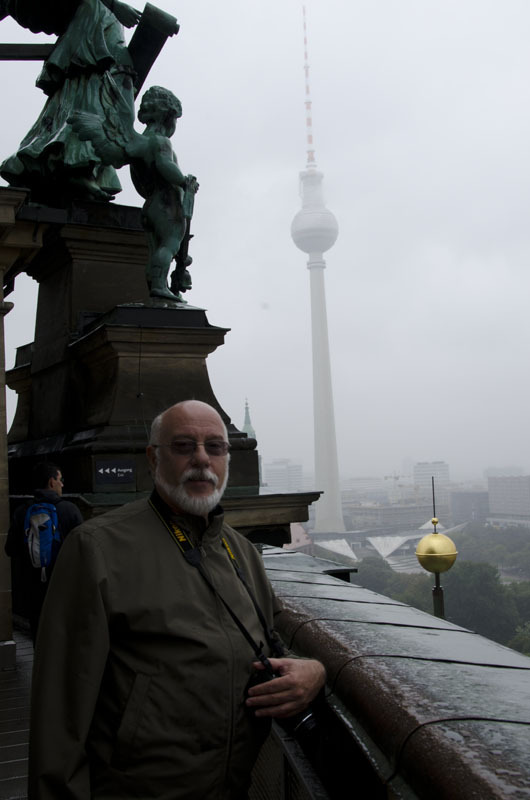 Gerry, the typical grey rainy sky of Berlin, and the TV tower in the mist. From below the church, we ranged to way above. The first stop upward brought us to the box seats. Impressive view of the church floor and the altar, just like the box seats in a theater give you an impressive view of the stage. Onwards and upwards, we came to the base of the dome. From this level, windows gave us a rather smudgy view of the city. Now onto smaller stairways, these twisting and turning as they go up, and we emerged outside, into a light rain, to see a foggy, but suggestive, view of Berlin all around us. A panorama from the top of the dome. The red thing is the Humboldt Box. By this point, we were drooping, and drooping badly. Even I was thinking I might pass out it I didn’t go lie down. We were back onto the train, and once again at the hotel desk with fingers cross….Yes! Our room was ready (though it was but one o’clock). Definitely, one of those “Yes! There is a god” moments! I don’t even remember removing my clothes, and I know I didn’t unpack my suitcase, before I was asleep. Between a couple of hours of sleep and good strong shower, it is hard to say which contributed the most to getting our spirits up and embuing us with new (if short-lived) energy to go out again. This time, dressed for the cold, we ventured back into Central Berlin, getting off closer to the Brandenburg Gate. 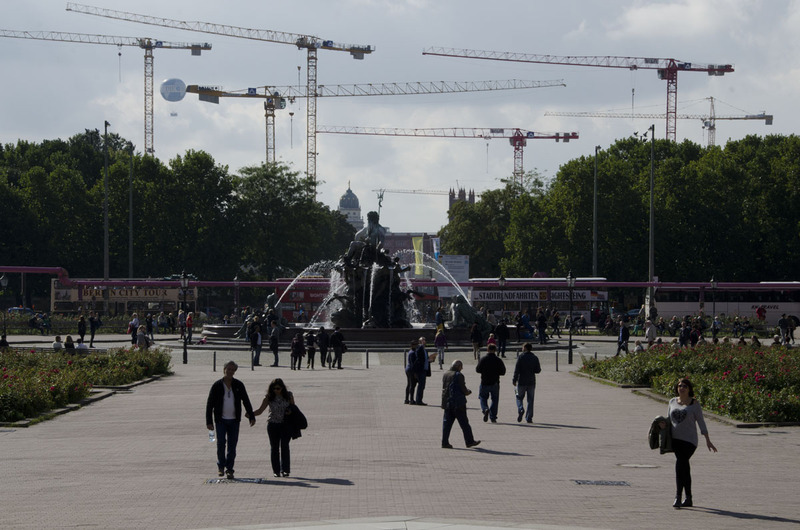 We got to walk on the famous Unter den Linden, but the effect was completely negated by the fact that the center is ripped out for the construction of a new section of the U-bahn. Still the similarity with the Champs Elysees is impossible to ignore. Protected by our trusty red umbrella we walked up the street to the Brandenburg Tor. The gate is impressive, though it looks a bit squeezed in between all the buildings (including the US Embassy) that surround the Pariser Platz on this side. 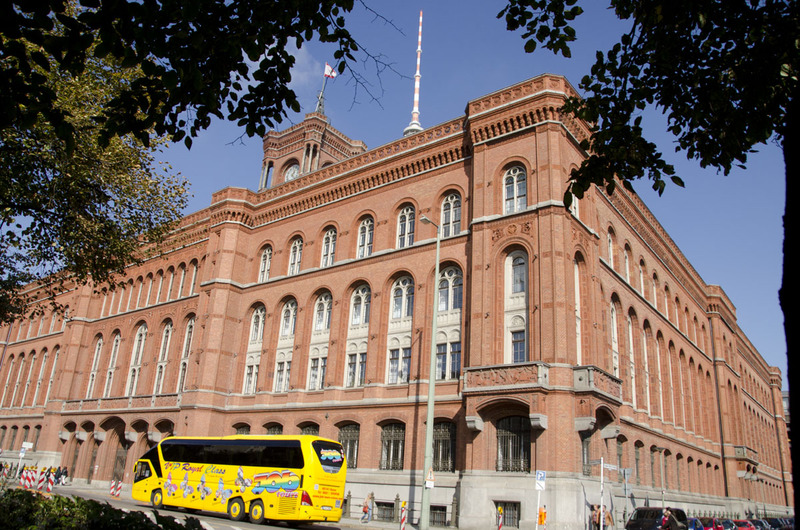 Other notable buildings there include the Hotel Adlon and the DZ Bank of Frank Gehry fame. That was closed so we will have to wait until Monday to see the inside. 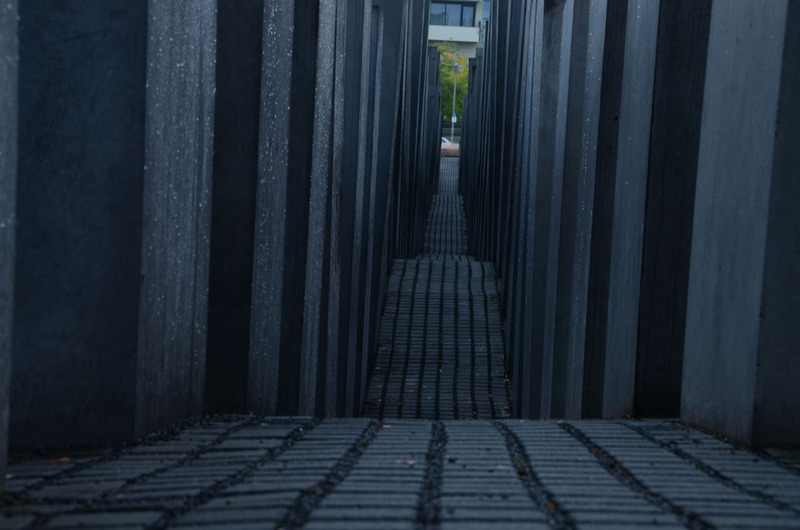 We passed through the gate and turned left and wandered down the street to the Holocaust Memorial. 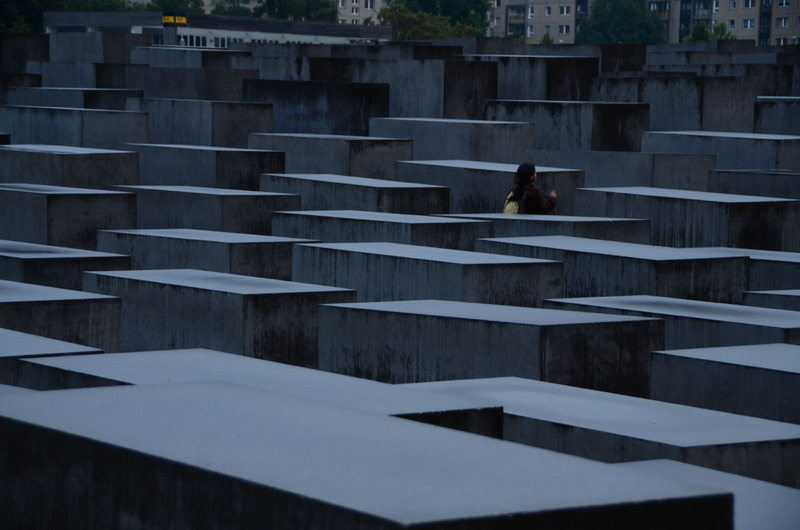 A very interesting construction, the memorial is made up of rectangular structures that are immediately recognizable as resembling graves, even if you don’t know what you’re looking at. They stretch off in neat rows, but vary in height. In some places they are as low as your knees, while in others they tower over your head. The rows are narrow, and the light is dim. We eavesdropped on an English speaking tour guide who explained that the graves feel anonymous when you’re looking at them from the edges (and in fact, none of the structures nor even then space itself has anything to identify it), but, she said, as you wander deep into the memorial, you get a sense of the individual people who died. She also explained that the exhibit and document center for the Holocaust is underground to prevent it from being a target for neo-nazis. Next we set off in search of Potsdammer Platz, eventually finding it just before we completely melted down from hunger. It was hard to enjoy it or even really want to explore it when all we could think about was eating (our two breakfasts being the only food we had had so far). Near the Canadian embassy we spy a place that is really busy, and that’s all it took. In we went. Later we commented that we had come all the way to Berlin to eat Indian food! So be it! It was great, we were satisfied. We also had a BIG glass of dark beer that was delicious. I am hoping to find more of that. After dinner, in a veritable food coma, we somehow found our way back to the hotel, and to bed. the big section of the Berlin wall that is still standing near our hotel. That also gave us a chance to take a look at our neighborhood. There is lots and lots of graffiti everywhere, and we saw plenty of people coming out of hidden nightclubs, still drinking beer (though it was about 8:30 in the morning!). Much of the area between our hotel and the river is abandoned and condemned buildings. Lots overgrown with trees and bushes hide not only these clubs, but homes of squatters as well. From the bridge over the river we could hear the bass beat of music (Unst! Unst!) coming from somewhere. We read (though neither of us could find exactly where) that the squatters were artist who refused to move. I don’t know if I would have called the people we saw artists, but there were definitely people living in these lots and buildings who were off the grid. In fact, the police had barricaded the streets around one such area to car traffic, and seemed to be conducting some sort of operation … we didn’t stick around to see exactly what they were doing, but there were lots of them doing it! On and on we wandered, marveling at the new buildings existing right alongside the abandoned ones, and thinking that this area was becoming gentrified. We stopped in a corner cafe for coffee and a breakfast version of a spanakopita (?) then resumed our wandering now in the old harbor section of town. 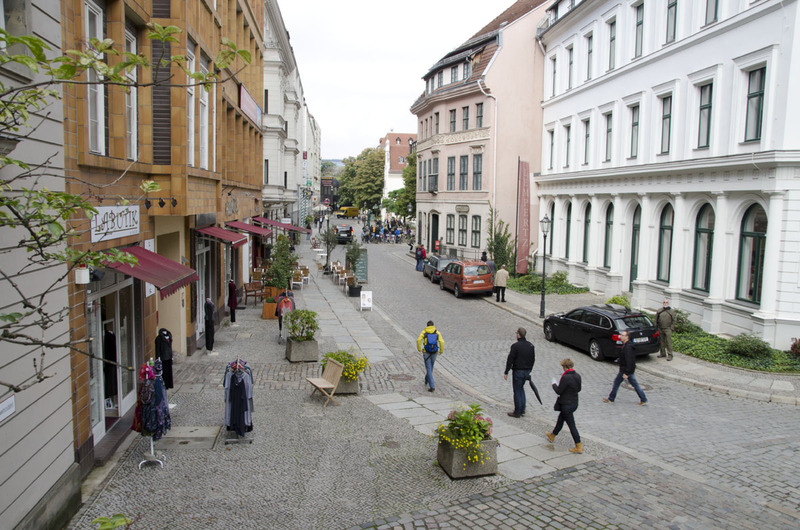 By this point we have a destination, the Nicholaiviertel, the oldest neighborhood in the city. The neighborhood gets its name from the St. Nicholas church in the quarter. It looks like France, here – lots of shops and restaurants spilling out into the narrow stone streets of the area. The sun is out too and the feeling is festive! since the early Middle Ages, and during the restoration, the restorers found traces of those earlier times in the footings of the church. The restoration, again, pick your era, took this church back to its early Gothic stage. The original colors were discovered beneath the layers of paint. Fragments of the brick work were painstakingly pieced back together, so that modern bricks could be made in the same shapes. The result is quite lovely, very calming and serene. The museum covers many religious topics, as well as a bit of history of the two cities that merged to start the city called Berlin. Pieces of sculpture from the original church are on display as are artifacts they found as a result of the graves and tombs that were opened and destroyed by the bombing. Upstairs, in the loft that houses an immense, modern organ, you can even sit and listen to gorgeous choral and organ works which just happen to also be on sale down below. Leaving the church we wandered further, now on the way to the Rote Rathaus, where the mayor of Berlin and the city council do their thing. It was hard to appreciate it. Again, there was construction for the underground rail going on right in front of the building. We maneuvered around the construction to see the triton fountain, and the TV tower. That has become my icon of the city! The Triton Fountain with, of course, construction cranes. 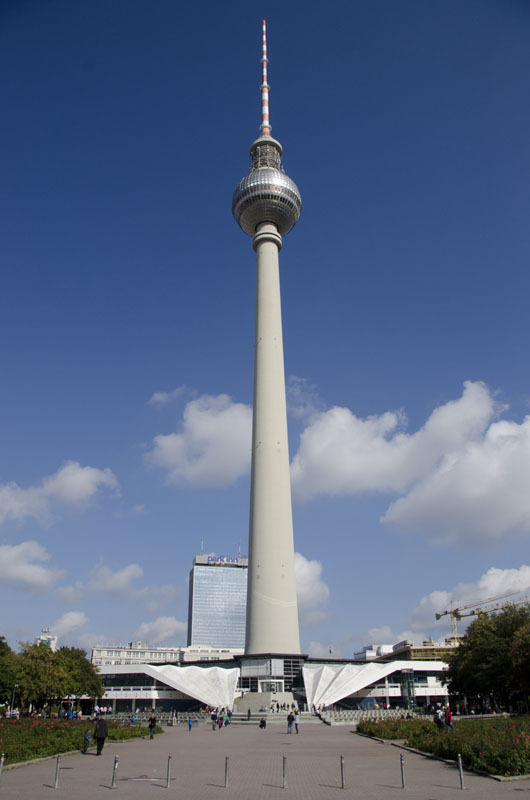 We decided not to go to the top of the TV tower, even though we had the perfect weather for it, because the lines were just too long, and once again, I was hungry. For lunch, we were both dreaming of a nice curry wurst and a cold beer, and our wishes were granted at a park in Alexanderplatz. We bought our food and drink from different kiosks and found a place at the picnic tables set up in a park. Two curry wursts and French fries with mayo, wash it down with a cold, cold pilsner and you’ve got one, good lunch! Once again, fortified and reinvigorated, we headed off to find, what I mistakenly thought was, the Reichstag. Instead we found another part of the museum island, and after a brief tour of the outside, a reconnaissance mission actually, we headed back to our hotel for a rest. Saturday, after logging over 19,000 steps on Fitbit, we opted for dinner near the hotel. There were just two choices, Cuban or pizza – we went for the pizza. This morning we slept in, waking just before 10! Still we got up and out within an hour. Thinking it was a nice day, we decided to seize the bull by the horns and go to Potsdam. However, once outside, it was neither as warm as our weather apps said, nor sunny, which was our impression from our room. 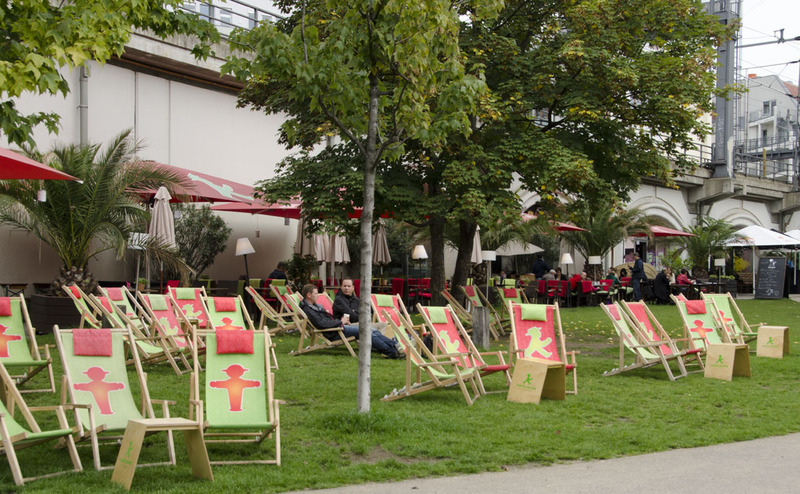 We ate breakfast in a bier garten in front of the station and changed our plans. We’d do a museum today instead. Once again on the train and again off at Hackesher Markt. We walked the long way around to the Pergamon Museum, in order to walk along the river. Blessedly, walking this way, our views did not include the ubiquitous cranes and construction sites. We crossed the river at the Bode Museum, which is the only place that particular bridge goes. It seems that the museum is right at the tip of an island formed by the fork in the river. 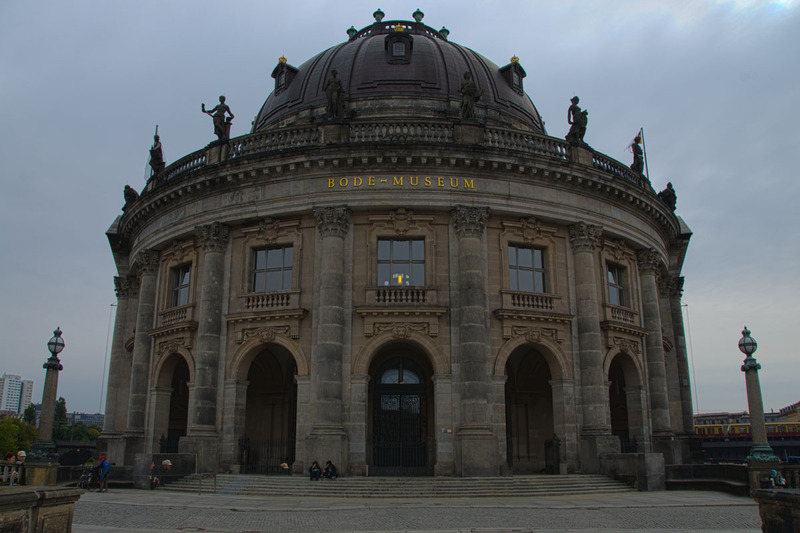 The Bode Museum – which we didn’t visit. A couple of interesting things I have seen in the last two days may be worth mentioning here. One is the sling chairs set up outside the cafes. 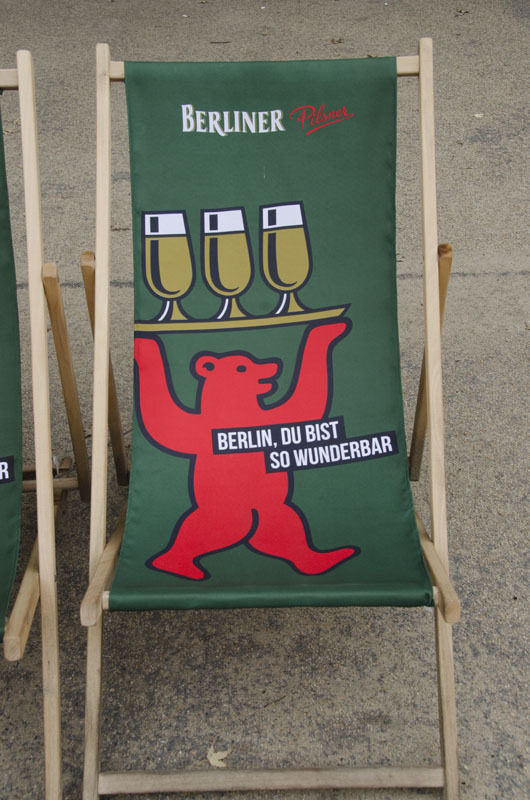 It would appear that you can sit in these chairs and enjoy the sun, as if you were at a beach, and drink beer. I saw people doing it yesterday in the park where we stopped to get our curry wursts. It seemed quaint to me then, but today as we were walking along the river I noticed the chairs, now empty because the day is not so conducive to this, and realized that it is not unique. I actually think it is a great idea. How relaxing, to sit out in the sun, drinking beer, and watching the people promenade along the river! Ready for some sun and beer? Another thing that was much in evidence everywhere today were street markets, of mostly book dealers and antiques dealers. Today is Sunday, so I am thinking this is a Sunday phenomenon: We haven’t seen them any other day. They were only just breaking down when we returned to our hotel at about 4 this afternoon. Meanwhile, today we visited the Pergamon Museum as I might have mentioned earlier. By the time we had walked back around on the other side of the river, we were back in all the construction. In this area of Berlin, the so called Museuminsel, the museum island, the construction is an underground linking of all the museums. It is a major project, which to imagine the scope you have to realize how enormous all these museum buildings are. 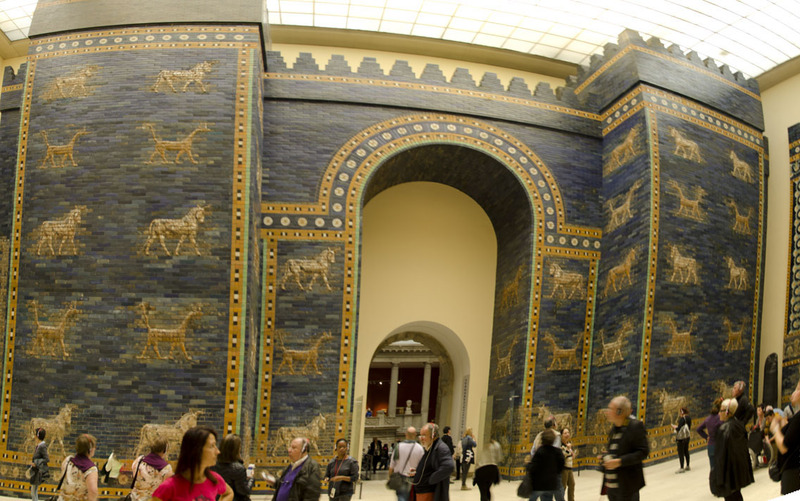 The Pergamon Museum houses the Pergamon Altar, the Ishtar gate and the Islamic art collection. It is rated by others as a “must see” and I concur! 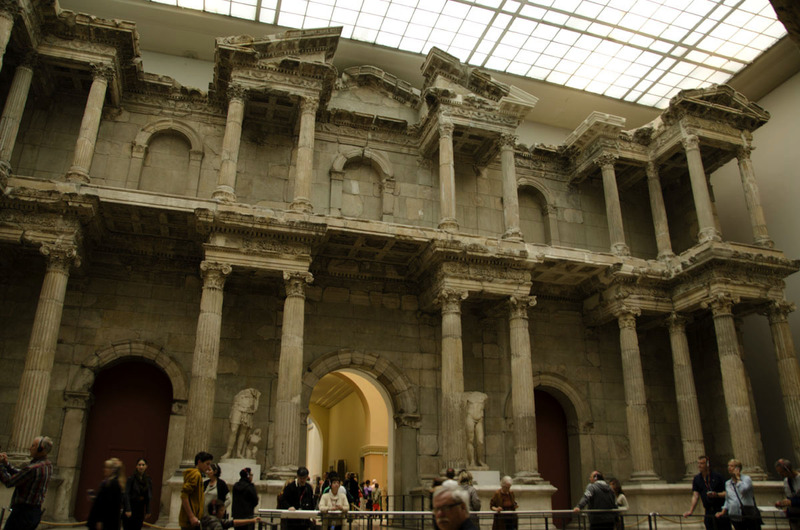 The first room you walk into holds the Pergamon altar, though not set up like the original building at all. You can get a sense of the front of the temple, with the massive staircase that takes you up to where the inner sanctum would have been. But instead of finding the fragments of the “altar” ranged around the base of the building as they would have been, they cover the other three walls of the room. The benefit of this arrangement is that you can sit on the massive staircase (just not near the handrails), and listen to the audio guide and let your eyes do the walking around the room. The frieze depicts the Greek gods battling the giants, the children of Gaia. It is amazing sculpturally. The relief is very deep and very detailed. The scene flows around the room, depicting a moment in the battle and showing all the gods at work. (The gods were victorious.) At the top of the stairs is a small display room that contains another frieze, of an entirely different style, as well as fragments of statuary found at other sites in the same complex at Pergamon. Especially notable is a beautiful mosaic floor with a parakeet. The parakeet mosaic. check out how small the tesserae are. As I walked into the next room, I was truly awed by the sight of a huge stone gate, from the Roman city of Miletus. The entrance to a market, this enormous structure is the largest one in any museum in the world. It is impressive. But it isn’t the most impressive thing in the museum by far. The market gate from Miletus. 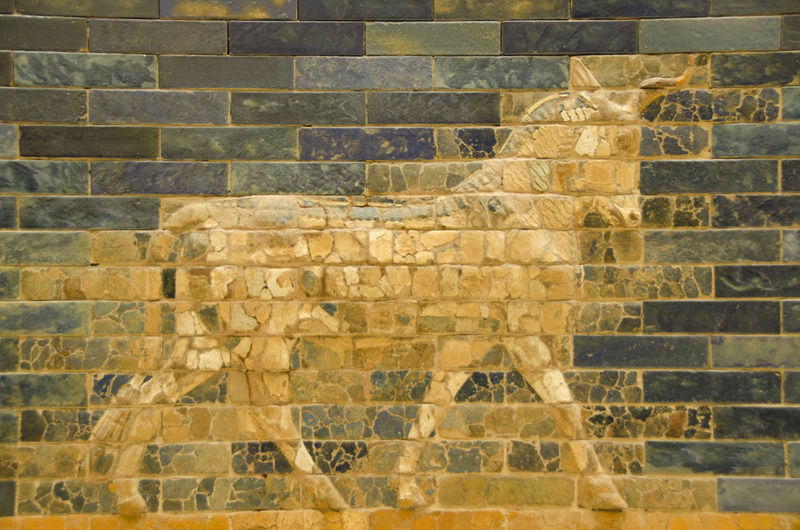 That distinction has to go to the Ishtar Gate, an absolutely beautiful work of art and architecture. The gate that is reconstructed in the museum is the smaller outer gate to the palace of Nebuchadnezzar II. In the wooden model, you can see an even larger gate was just behind it. By the way, Ishtar is a goddess, not a place. She was the goddess of love and war (how appropriate that those go together). Her symbol is the lion. Also featured on the gate are two related gods, represented by a chimera or dragon, and a fierce bull. The gate is decorated in blue tiles, with bulls and dragons alternating up the side. It was in the long processional courtyard where Ishtar’s lions protected the king. A section of that courtyard is also reconstructed to give you the sense of scale and majesty that this structure would have commanded. 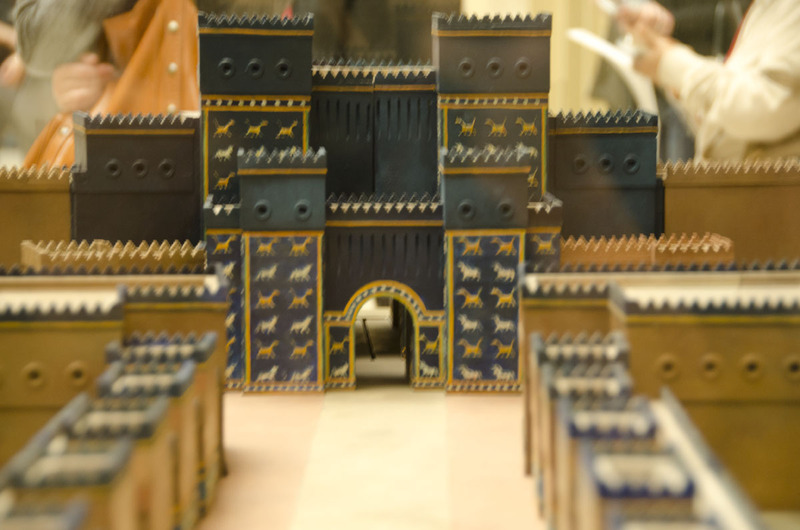 The model showing the smaller and larger gates and a bit of the triumphal way. 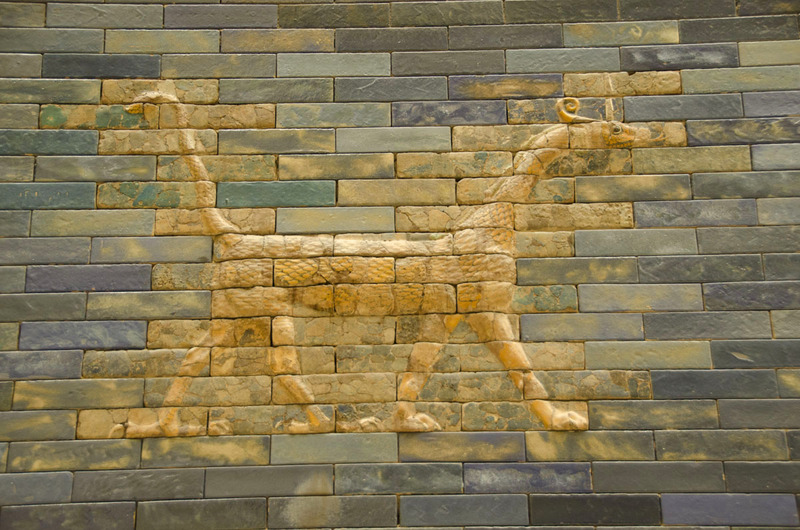 The chimera or dragon from the Ishtar Gate. The museum continues to provide wonderful insights into the buildings of the ancient Middle East, both large and small. Together with massive sculptures you can see delicate metal workings and jewelry. And the section on Islamic art takes you through all the decades of their influence from the 8th century to the 13th. It surprised me that it did not end with the Mongols hoards. The new rulers continued to patronize the artists of their realm and their traditions continued. The collection takes you right to the early part of the last century. The audio guide to this museum was thorough, but very slow. If you are a fast reader, I would forego the guide and read the exhibit labels. Not all are in English, but certainly the major pieces are in both English and German. It was also too warm in the building during our visit. There are lockers provided, and which you must use for backpacks and camera bags, so I suggest you use them or the coat check so that you are not carrying your coat through the exhibits. Pictures are permitted and you will be hard pressed to get a picture without other people in your picture taking pictures! From the museum we walked out and into the Lust Garten in front of the cathedral. Lust as you might guess means pleasure and it is ironic that this is in front of a big church, or at least I found it so! 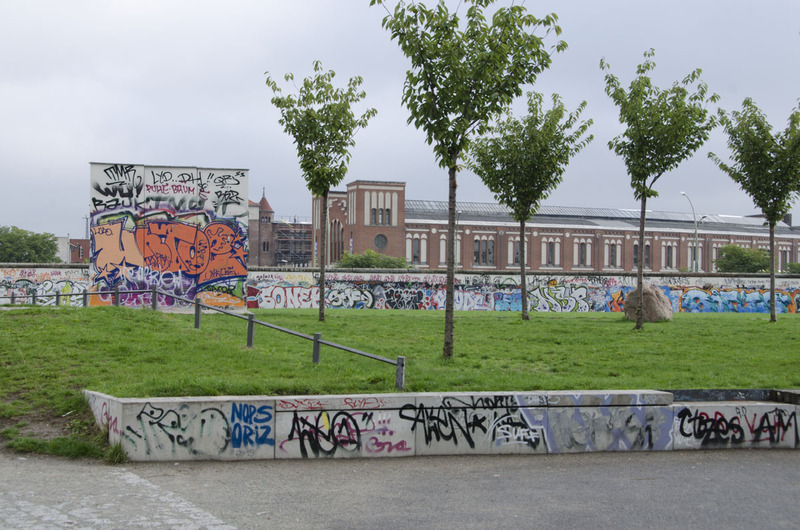 The area is a huge grassy space with the Dom on one side and another enormous museum to its left. Now, the Humbodt Box is on the right side, but it will be there only until all the construction around the museums is finished. Behind and beyond the box, majestic buildings stand, my guess being that they will all form part of this complex of tourist attractions at some point in the future. Gerry says he overhead 2018. One can only hope! Cranes! The Humboldt box is that squarish thing. Running through all this is the famous Unter den Linden – along which it seems that every other building is covered in scaffolding and the middle of the street is being dug up for the underground. What a mess. Wait until 2018 to go! 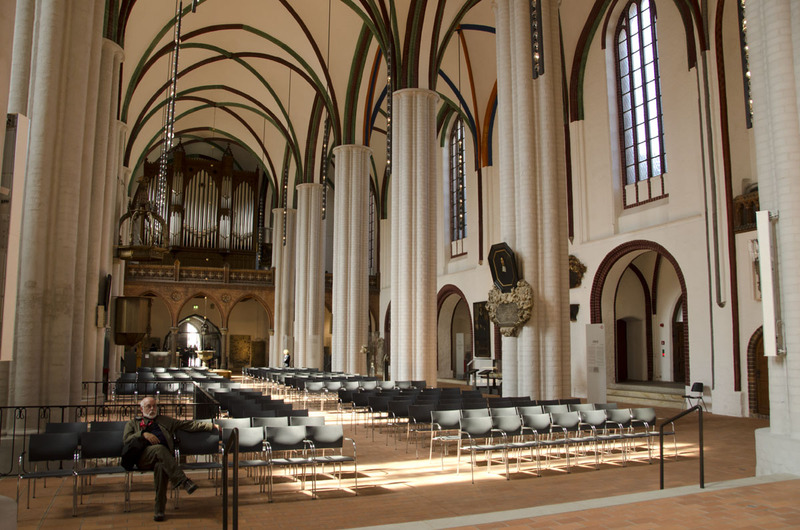 Interior of St. Hedwig’s church. 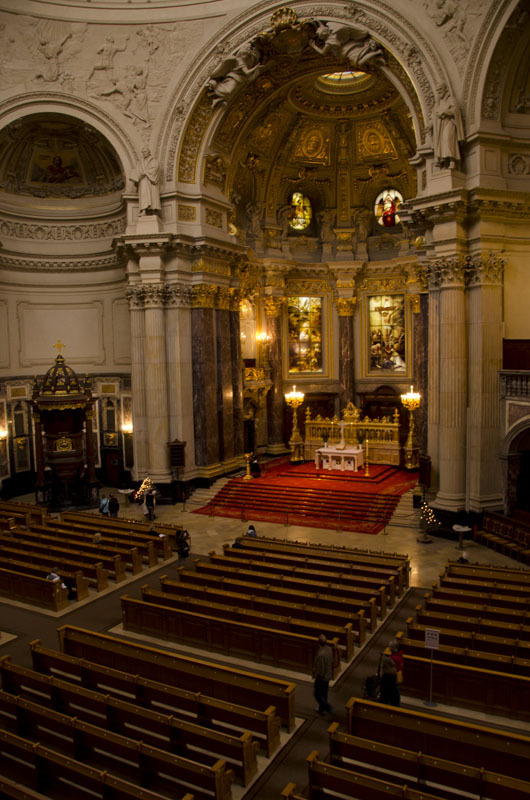 We also discovered St. Hedwig’s Church, the seat of the Catholic Church in Berlin. This building is modeled on the Pantheon in Rome, and is just beautiful inside. 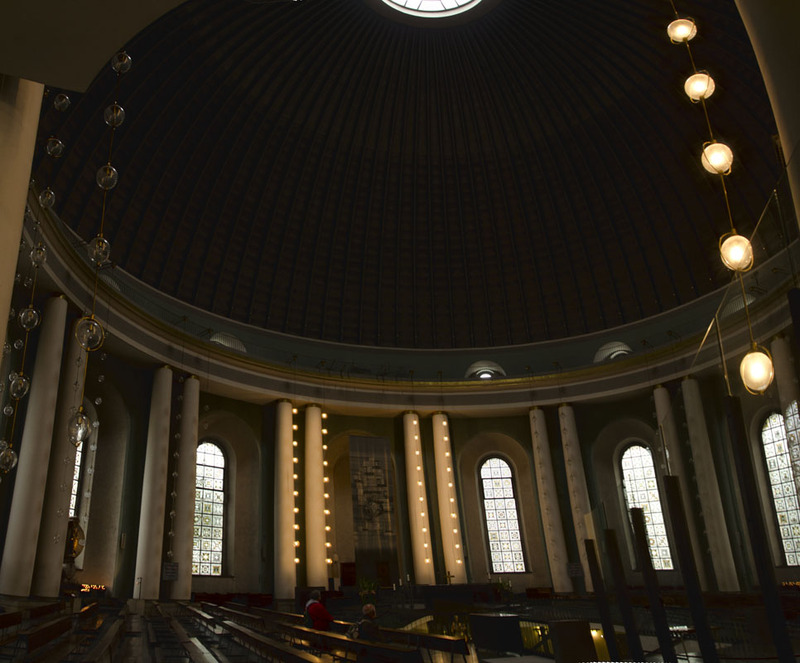 Though pictures are allowed, it was impossible to convey the beauty of the church and the enormous domed ceiling. Back out on Unter den Linden we walked towards the Brandenburg Gate but stopped for a coffee and a sandwich at the Microsoft Digital Eatery. Free WI-FI here, so we took advantage of it and placed a call to Oscar, who is headed to Miami today to begin work tomorrow. 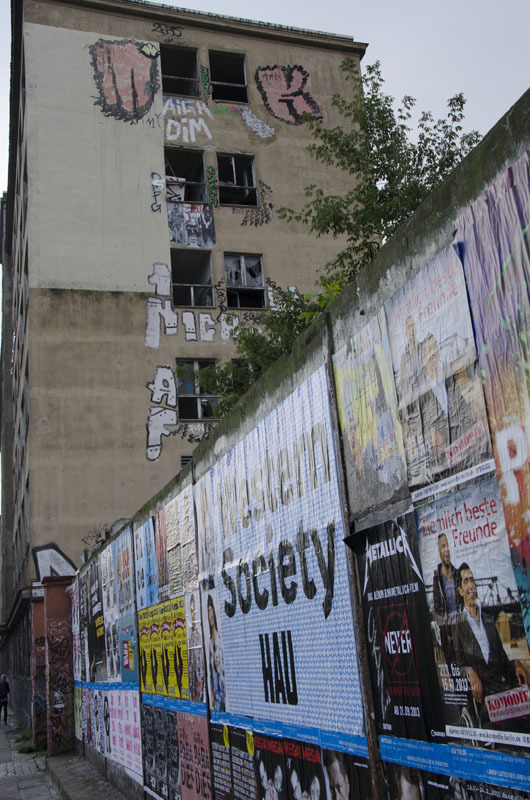 We also took the time to check Facebook and emails, and I went to look up the relationship between East and West Berlin, and between West Berlin and West Germany. I was curious how the little island in East Germany that West Berlin was could logistically survive. What I read was pretty complicated, not always amicable but not always hostile either. It is interesting that the Allies ever thought this relationship with the Soviet Union was going to work out. anybody gget that type of info in such a perfect way of writing? Thanks for reviving some memories, Betsy! Bob and I lived in Germany from 1993-1995. Fascinating country with such cultural wealth and complex history. I may have been warm on one or two days during that two years!